This was a beer tasting that definitely did not run according to my expectations: what was up went down, and what was low rose high. Just goes to show: a guy can be 40 but still able and willing to change his mind. It all started innocently enough with the arrival of Anne and Nicholas, aka The Freelance Statesman Who Writes From the Heart of Europe, and despite the distraction of whining young females, not much time was wasted in getting to the beers. 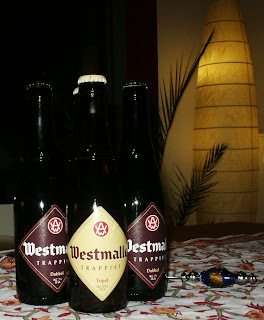 First came the Westmalle Dubbel. I’d tasted it before and not been overly impressed, so I was not expecting much. Was just hoping to get through it to the tripel, which I’d also had before and recall enjoying greatly. The dubbel pours a rich, dark reddish brown. I found caramel in the taste at first, but then a host of very pleasing malty and charcoaly flavours: burnt popcorn and stewed raisins (maybe prunes?). I found its fizziness fairly low, despite the fact that it exploded over the table upon opening. The aftertaste is a pleasantly lingering bitter hoppiness, with the 7% alcohol well hidden. Was this the drink I’d tired before? Surely not. This was something noteworthy and thoroughly enjoyable. Nicholas made similar, though more extensive, notes on the dubbel. “Caramel and mildly nutty (like our host? )” -- thank you very much -- “definitely malty”, “medium heavy with salty olives that offset the taste well”. Something stewed in there, he agreed, but not raisins: “not really fruity”. He thought it was very fizzy -- “almost assaults the tongue” -- and found the aftertaste slightly acidic. Moving through dinner and on to the blondish tripel, the Freelance Statesman noted, “very sweet” and “strong”. More sour than bitter aftertaste. Alcohol at 9.5% was too obvious, suggesting someone had added a bit of vodka. 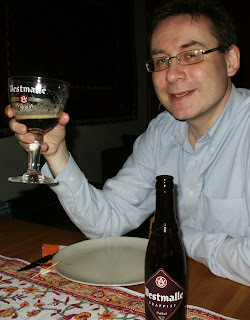 He captured the tasting for me exactly, when he wrote, “not as exciting as the dubbel”. The tripel was for me just not distinctive enough to write decent notes on. Thoughts of pepper, Swiss cheese and turpentine flashed in my head, but I could tell I was reaching as I wrote my notes. 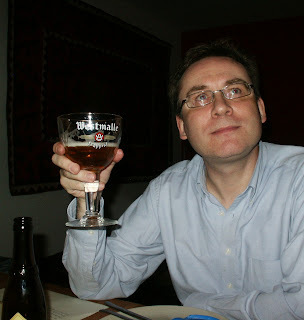 As he was explaining tomorrow’s start of the new season of Torchwood to me, Nicholas wrote of the tripel, “too strong without enough taste to make it sophisticated”, which may seem a bit harsh, but I have to say, that’s how I felt too. Again, I could not believe this was the beer I’d tried before. 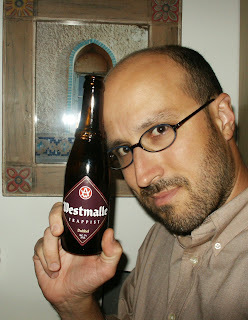 My thoughts on Westmalle went all topsy-turvy. Previously, I’d disregard the dubbel and touted the tripel. After tonight, I would make my recommendation the complete opposite: drink a dark dubbel, but turn from the tripel.